A dear sister gifted me this print by R.C. Gorman, an indigenous American artist whose whole body of work is an ode to the feminine. This piece, called “Tazzie’s Baby” epitomizes the qualities of caregiving and protection. The little child’s slightly perturbed face peeks out from behind the massive folds of their mother, Tazzie’s, cloak and Tazzie is using her body as a shelter for her child, arching over and watching over her little charge. It’s a beautiful piece that I will cherish forever. And then there’s another piece that comes to mind for me as I consider the image of caregivers. 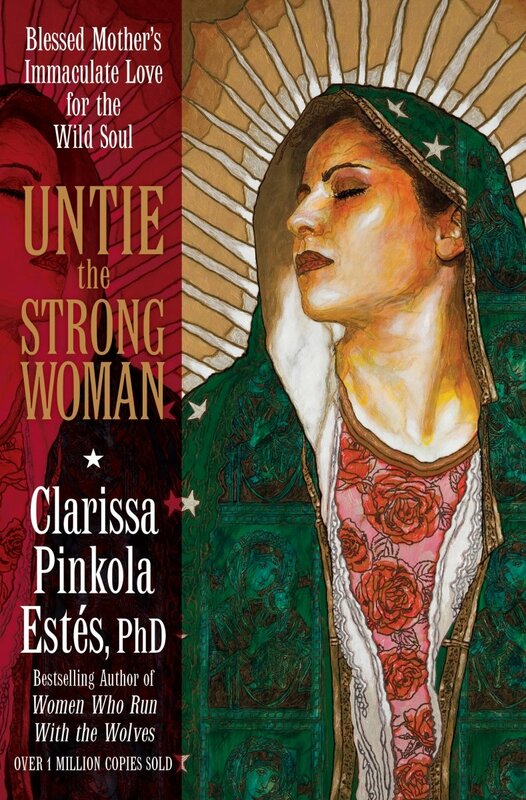 I came across it in Clarissa Pinkola Estés book, Untie the Strong Woman: Blessed Mothers’ Immaculate Love for the Wild Soul. You can see the image on Pinterest here (I don’t own the copyright for this image or the R.C. Gorman image so I won’t embed them in this post). The image is of the mother of the divine, in a similar pose arched over the divine child, but this time she wears the “Shirt of Arrows” a symbol of ultimate protection. Her strong back has accommodated a flurry of embedded arrows, but her soft front cradles and protects the undying spirit. These women talk about how when they started their vitally important work in the organization they wanted to make a significant contribution to, they had five clients a day, that over the years was increased to six, then seven, and then to “the maximum” where every hour of their day was scheduled with the expectation that they’d do their paperwork, have their lunch, tend to their self-care and use the restroom in an hour there was (hopefully) a “no-show.” They talk about the fact that their employer leaves the problem of how to find the time to offer an appropriate level of care to them to work out, rather than actually giving them enough time to do this in each client interaction. They talk about the expectation that they’ll care for an elderly father who abused them as a child. They talk about teenaged daughters who, for all intents and purposes, hate them in response to them offering as much love and support as they possibly can scrape up from the depths of their soul. Women caregivers pull on the Shirt of Arrows every morning of every day for a good chunk of their life. Some of us feel isolated in our homes; some of us feel overwhelmed in our workplace; some of us feel angry over unmet needs; some of us feel shame and a sense of not being good enough at this vocation we’ve lovingly chosen. And, we can do something about it. Get into circle with other women regularly and talk about your struggles with caregiving. This might be a coffee once a month at your favorite coffee house with three close sisters. This might be a circle that has grown in your local area as part of WisdomWomen or Gather the Women or a Red Tent. It might be a casual gathering of your workmates to decompress and share stories. When women get together, we feel a common humanity that helps us to feel less isolated in our experiences, we feel held in the kindness of other women, and we feel seen and heard. The value of this in our culture cannot be underestimated, in my view. Practice self-compassion. Those of us who are paid to offer compassion to others are often expected to do that at the expense of ourselves. Outer compassion is encouraged and inner compassion is considered selfish, weak, indulgent, unethical, surprising and even disgusting in some professional caring cultures. The reality is that practicing self-compassion gives us the inner resources we need to offer more effective and more sustainable outer compassion to others. Tune into your self-wisdom and your somatic experiences so that you notice when your body is telling you something is not OK and you can move toward setting some boundaries. I’ve heard women say that they told their boss that they’ll be no good to the organization once they’ve burnt out completely or that they will quit if they don’t get another staffer because they are about to lose their ability to function in the workplace. These courageous boundary-setting practices are what caregiving professionals can empower themselves to enact, and these practices can help give us the confidence we need to set boundaries earlier and earlier in the evolution of a burnout. Our bodies will give us louder and louder messages about trampled boundaries until we finally listen; the loudest message of all will be an inability to function. Let’s listen to our bodies and respond to what it needs before we get to this point. Get some perspective on your identity as a caregiver. Do you worry that if you don’t have this identity you won’t know who you are? If so, allow yourself to creatively visualize the life you would lead if you weren’t in this role. Allow yourself to see that you would still exist even if you don’t have this title. Make it less scary to consider yourself as an intrinsic self and soul whose inherent value extends beyond this heart-focused vocation you’ve chosen. You’re not saying you want to be rid of this part of you; you’re just getting a larger perspective. This can take the pressure off your sense of self and help you detach from your job, just enough to give you some clarity and an opportunity for creative thinking. Just knowing that you are larger than this particular part of your life can be a hugely nurturing act of mindful self-care. One of the most damaging and telling statements I’ve heard one woman say to another in relation to vocation decisions is, “You don’t want to be just a mother, do you?” Pause for a moment. What is the most important vocation any human can take up? Is it not birthing and raising another human? Is there any job on earth more important than this one? Without humans there’s no human race to do anything else. All of us who are birthing, raising, teaching, nurturing and supporting humans, be they their own children or other people’s children at any age, have the most important jobs in the world. Let’s be more proactive and outspoken in valuing parenthood as the most powerful body of creative work one woman can give to her community and valuing the caregiver’s Shirt of Arrows as a radical act of resistance. If you’re in the Kansas City area, come along to our Mindfulness Day Retreat for Caregivers and Everyone Who Cares on October 7. If you’d like to connect online, email me at kristy@heartworks.training to tell me about your workplace, your creative space, your homespace and your struggles – I can email back some suggestions specifically for you. If you’d like to travel on with a companion for a while, check out the HeartWorks Radical Emergent Self-Wisdom mentoring program or the Radical Emergent Self-Wisdom for Teachers mentoring program. I’d love to spend some time with you in service of you and all sisters who wear the Shirt of Arrows. Important note: I want to acknowledge and honor all the amazing men in caregiving positions as well, and I’d love to write about how men can support each other in a future post. If you are a man in a caregiving role, I’d love to hear from you!